Some interpretations of the Ishango rods suggest there are “prime numbers” on them, and this raises the question about how complex calculation were in Africa before colonisation. 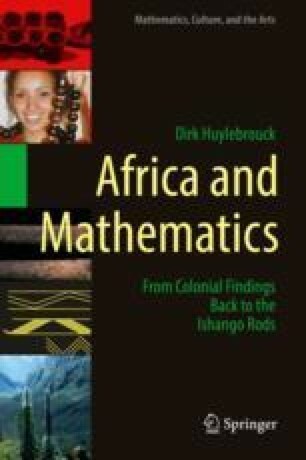 This chapter presents two examples: the multiplications of the Yoruba and of the Ethiopians. The first uses the base 20 and shows that the base 10 is not indispensable for difficult calculations (cf. the question if the Ishango rods were made in base 12? ), while the second shows the importance, for the multiplication of two arbitrary numbers, of doublings and halvings (also noticed on the Ishango rod). Incidentally, the final part gives a graphic representation of a relation between the execution of the latter, the Ethiopian multiplication, and modern computer science.